NEW SINGLE “QUEEN” OUT NOW! Available To BUY And WATCH Now! An Afro Soul Funk fusion inspired by the Moriybayassa traditional West African rhythm . ‘Queen’ is an upbeat celebratory tribute and affirmation of growth, love, respect and admiration. Featuring the incredible talent and essence of musicians: Anders Olinder, Barney Sage, Bi Do Irie, Joe Price, Ian Valin and Break. Amazon Music: http://amzn.eu/d/5C0WEp8 And all other major online outlets. This entry was posted in News on 03/09/2018 by Celestine. This Funky, Jazzy Soulful Quartet always leaves audiences wanting more or extremely satisfied (! ), consists of James Morton – Saxophone, Anders Olinder – Keys & Left Hand Bass & Craig Connet – Drums. Add to that soulful vocals, exquisite harmony, world class musicianship and ALOT of energy! We’re playing in one of the liveliest venues on one of the liveliest streets in the UK – a perfect fit! This entry was posted in Gigs on 24/02/2015 by Celestine. Post by Bristol Jazz & Blues Festival. This entry was posted in Gigs, News on 24/02/2015 by Celestine. 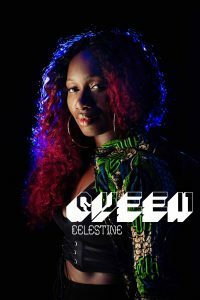 Headlining the night: the beautiful & talented Celestine, star of BBC’s The Voice Uk! She will be performing Motown hits with her amazing band. Support Act: local band Truth & The Happy Endings, renowned for getting any party started, they will be performing a soul classics set for you all. DJ playing Soul, Funk & Motown to dance the night away! This entry was posted in Home Page, News on 29/07/2014 by Celestine.